Wow. Your words are captivating and skillfully woven. I’m glad you stopped by ‘ Flies and Buddha’. Thanks for the follow, hon. I’ll be taking a look around your blog, too! The name of your blog just makes me smile 🙂 thank you for stopping by and following my world. I really appreciate it. I hope I can lend you a bit of inspiration for your writing and artistic journey! Cheers to you! Thanks for the follow on my blog. I think your posts are lovely as I browse through one by one 🙂 Glad to be in touch. I have nominated you for the Liebster Award. I hope you have fun as much as I had. How did you find my page? just curious ? I love your blog. You are GOOD – I’d use the word awesome, but chariezerol (above) got there before me. I don’t see any tags. Are you tagging/categorising your posts? It would get you more attention, and if you haven’t already done it, the Blogging 101 course is useful too. Your writing is too good to be hidden away. I don’t think there’s a lot of difference between tagging and categorising. Do you use Directions or Crazy Colour, or do you splash out on Manic Panic? 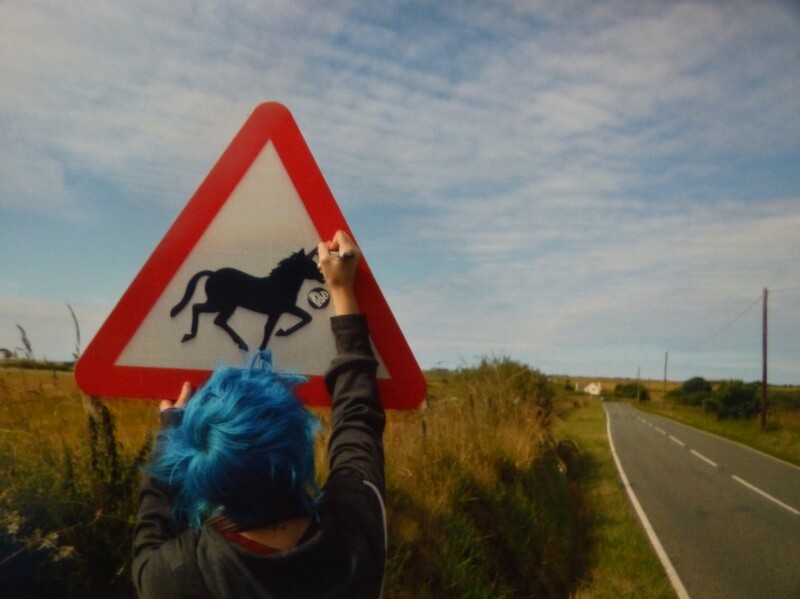 I love the blue hair….AND the name of your blog! 🙂 I am enjoying discovering your writing. Thank you for visiting my blog. Oh yes, and I have purple mixed in with my leaning-more-towards-grey hair! Been doing that for three years. Ooo he he mine’s been blue for about that long xD thank you so much! Thank you so much for stopping by the Cow Pasture and welcome to the fence jumpers. Thanks for the follow. I enjoyed your bits and pieces; I like the drawings. Did you do those too? You certainly have a creative talent, glad to meet you. I too am a writer and working on not being awkward and or dickish in my trudge through learning to self promote. Sadly it’s a necessity these days if you want to publish. Ah, longing for the good ole days when all a writer had to do was write words… and not network. Best of luck to you and thanks for the connect. Thanks for the follow and like on my story ! Love the variety that is you! Thanks for posting stuff. Hey there! Thanks for visiting and following – going to check out yours. Now how could one not come see what “putting the dog to sleep’ looks like! Glad you left me a follow. I’m doing the same. Hope to spend some time together. Awesome! You seem like a really cool person to talk to. And you also seem like a down to earth human being. I’m currently following your page. Nothing to be embarrassed about. You will have to try harder than that. 🙂 I saw your blog title and said: Oh NO! but when I stopped by your blog here I found out it was WONDERFUL and I look forward to following. Thank you for the interest on my blog! ah you followed me; Sheffield and creative writing are synonymous for me. Good luck with the writing. Thanks for the follow – looking forward to digging into some of the excellent-looking poems on here.